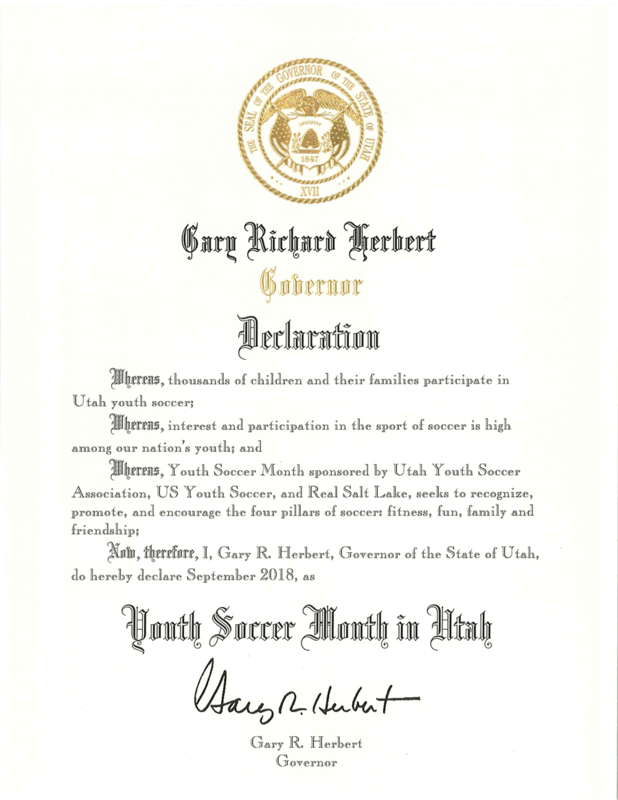 Sandy, UT – 8/22/18 : Utah Governor Gary R. Herbert has proclaimed September as Youth Soccer Month. Utah Youth Soccer Association will be celebrating Youth Soccer Month with special events throughout the month and throughout the state. Utah State University, University of Utah, Utah Valley University, Brigham Young University, Westminster College, Utah State University Eastern, Southern Utah University, Real Salt Lake, Utah Royals FC and Real Monarchs will also be participating. Emphasize soccer as the number one youth participation sport in America and a leading contributor to the healthy lifestyle of millions of American families. Bringing kids and families of all ages and all abilities together for fun, friendship and fitness. Highlighting the various programs available to children interested in participating in soccer, including inner city, special needs, recreational and elite soccer programs. Fun: Whether recreational or competitive in nature, involvement in soccer is easy, affordable and rewarding. Family: Playing soccer ties families together as schedules, vacations and family time are coordinated. Friendship: The relationships generated through playing soccer extend beyond the field. Fitness: The health and fitness (physical, psychological and social) benefits of playing soccer. Utah Youth Soccer Association has joined forces with US Youth Soccer in supporting Youth Soccer Month. Spreading the benefits and impact soccer has had on millions of Americans is very important to both organizations. Please take a minute to spend time with your family and friends this September to experience and support this great sport that has impacted so many lives. Recognizing the impact and importance the sport of soccer plays in the day-to-day lives of America’s families, and US Youth Soccer, is vital to the future of the sport. The nation’s largest youth sport organization is leading Youth Soccer Month, Celebrating Soccer in America this September. For more information on Youth Soccer Month visit www.YouthSoccerMonth.org.